The Whitley Wildlife Conservation Trust, which operates Newquay Zoo, has officially opened its first Changing Places assisted accessible toilet at the venue, as part of a programme of alterations to enhance accessibility. 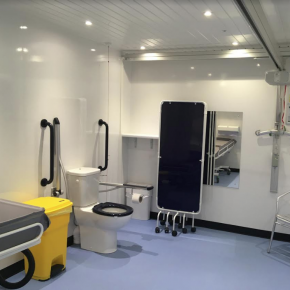 Supplied and installed by Closomat, the new facility includes an adult-sized changing bench, ceiling track hoist and privacy screen alongside the conventional equipment found in a wheelchair-accessible WC. The addition of the Changing Places facility comes as part of the Zoo’s new mission to improve accessibility across the site. Whitley Wildlife Conservation Trust, which owns Newquay Zoo, is planning to install more Changing Places across its sites in the future. Under Building Regulations and British Standards (BS8300:2018), a Changing Places should be provided in any facilities to which numbers of the public have access, and/or spend a length of time. Closomat can provide an in-house, ‘one- stop-shop’ complete package for ‘away from home’ assisted accessible toilet facilities, including Changing Places and Space to Change, from design and commissioning, through to project management, supply and installation. It is also unique in being able to additionally provide subsequent maintenance and repair.